Stairway to Heaven: Step In To Teichner Preserve! We often talk about Stewardship as our promise to care for the lands we have protected FOREVER. But Stewardship is also about today, and making our natural areas inviting, safe and accessible when you visit these spectacular places. Property Maintenance Specialist Chase Heise puts the finishing touches on the railing. So we are excited to report that a long-planned project has been completed. 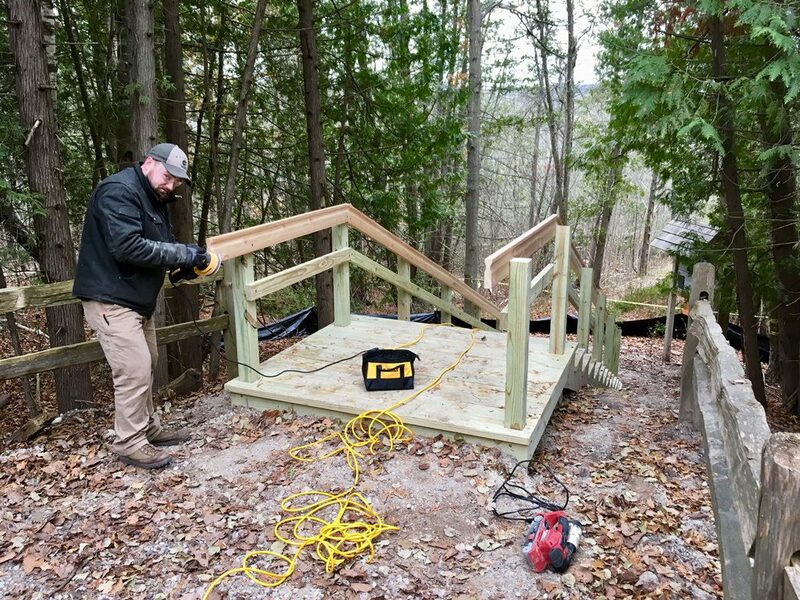 Thanks to our hardworking stewardship staff and volunteers, a beautiful new stairway at Teichner Preserve will provide better, safer access and a place for people to gather with our docents before a hike. Lining up all the posts and digging four foot holes was a challenge. How hard could putting in a set of stairs be? As it turns out, pretty hard! First there were permits to gather and architectural blueprints to follow. Then there were those four-foot deep post holes that needed digging, through old road bed gravel and tree roots. Our crew started in early October and finished just before Christmas, after passing three inspections and getting their equipment stuck in the mud more than once! 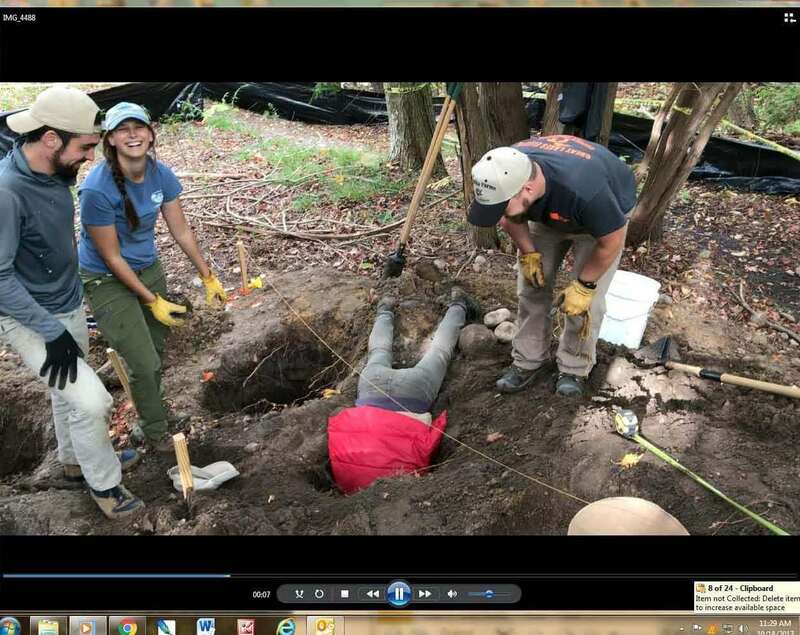 Chase’s dad and super volunteer, Dr. Michael Schmitt, has his contractor’s license and helped to guide the project. “It was a great learning experience,” says Property Maintenance Specialist Chase Heise, who had some super volunteers to rely on, including his dad, Dr. Michael Schmitt. Schmitt is a dentist by trade, but has his contractor’s license, which he obtained years ago when supervising the building of his own house. 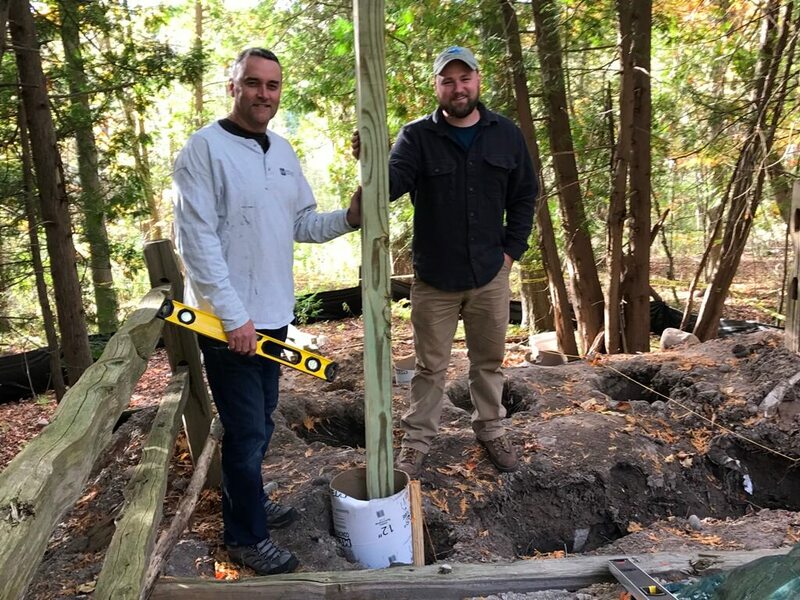 “He helped me to get the placement of the posts just right,” says Chase. “To be to code, everything has to be perfectly squared to the inch, measured and re-measured.” We would also like to thank Al Swidierski for his hours of help volunteering on this project. 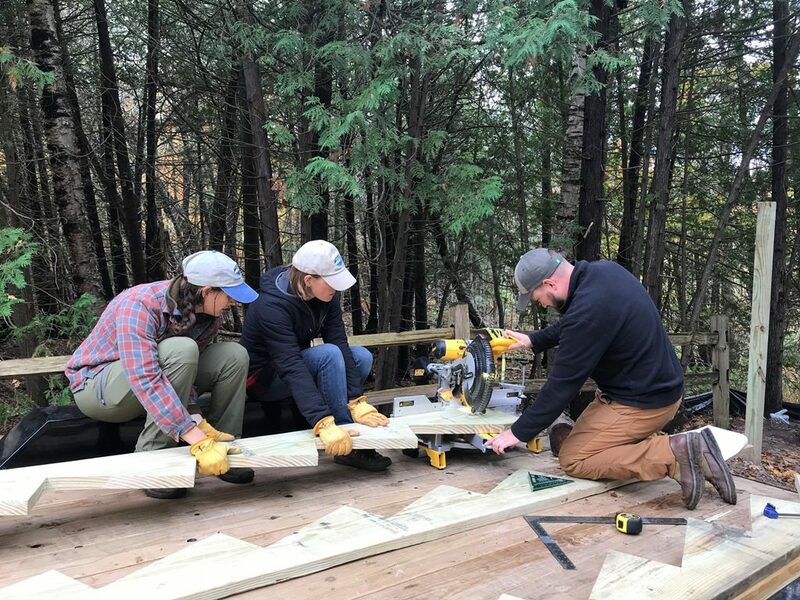 AmeriCorps Member Leah Robison, Emily and Chase measure twice, cut once. We are always working to maintain and improve the natural areas that you have helped to create, for maximum safety, accessibility and enjoyment. In fact our work at Teichner next spring will be improving the parking area to make it more level. Learn more about your stewardship staff here. 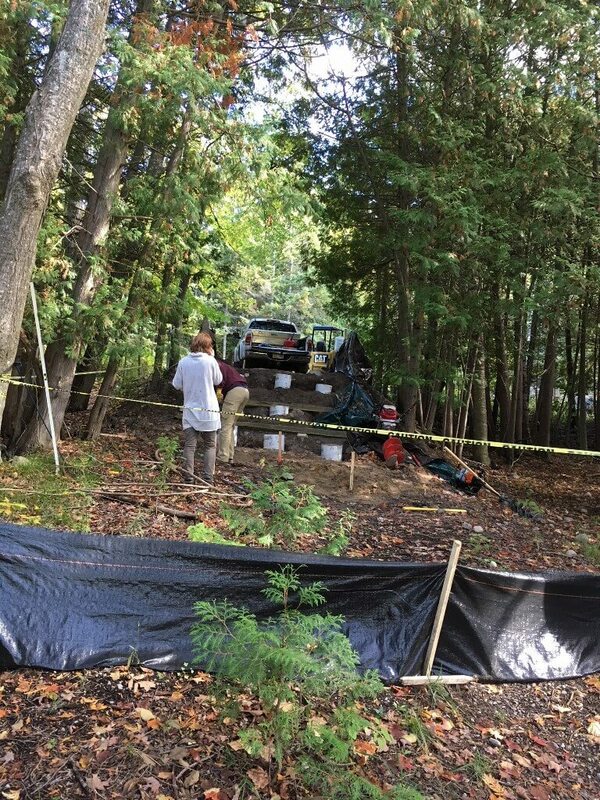 I am thrilled…i saw the beginnings of the staircase when I visited the preserve in August and got very excited. It’s perfect..and very needed. Nice work, everyone. The stairs are lovely. We watched their progress for weeks and were delighted to see the yellow tape finally come down. We tried the steps out (deep in snow) just a couple days ago. And as always, in Teichner, some nice birds along the path. Great job! Thanks for publishing this post. You have done amazing work to built these stairs. I am impressed, great project. What a great team doing a great job. Can’t wait to get up North to really see it. What a great team! What a beautiful job. Can’t wait to get up North to really see it. Wow..! Pleasing design of stairs are shared over here. What a great team work. Keep it up guys. This is a wonderful article and beautiful pictures of stairs were shown here and I have definitely bookmarked this design and I like to share with my friend also.